Happy Bloggers Challenge Friday! Sorry for the delay in posting today, I had my post almost finished, and we lost our phone service. Yes unfortunately I'm one of those who still needs to use dial up for computer access. Long story short, I'd have to have a 5 foot tower on my roof to get high speed.....So without further grumbling from me, I hope you enjoy today's post. Special thanks to Emily for letting me borrow her computer to get my post up today. I hope you've been staying warm this week, at least with all the cold weather and snow, we all have a good reason to stay in and stamp! I'm loving the look of the Antiqued Glimmers from the current Technique Junkies Newsletter. To create my background using the technique, I used Ranger Distress Inks in Spiced Marmalade, Shabby Shutters and Mustard Seed, my choice for Glimmer Mist is Pearl - I just love light sparkly color. 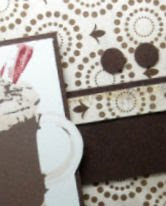 After my Antiqued Glimmers dried, I stamped Stampin' Up! 's Gratuitous Graffiti in Black Archival, then added the Baroque from Friends 24-7 in the same Distress Inks as my background colors. 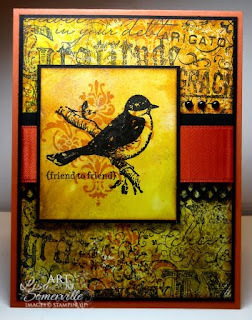 The bird panel is also done wiht the Antiqued Glimmers, stamped the bird from Friends 24-7 in Black Archival and added the Baroque in Spiced Marmalade. The sentiment is from Teeny Tiny Wishes, stamped in Black Archival using a SAMJ. This week I gave the Bloggers Challenge Players this sketch to work with, if you'd like to play along, just leave me a comment with a link to your card, I'd love to see what you created. I also have another Sneak Peek of one of the new Kitchen Sink Stamps being released next week, it also uses this weeks Bloggers Challenge Sketch. I'll be posting the full card on Monday - so be sure to check back! You're gonna love this months Kitchen Sink release! For more inspiration using this weeks BC Sketch, be sure to check out what the other players created by clicking the Bloggers Challenge Logo on my sidebar. Thanks so much for stopping by, have a wonderfully warm weekend! I LOVE this, Lisa!!! And the colors...yum! This is beautiful! I used to subscribe to TJ Newsletter, but so much of it is not SU merchandise and I try to be a purist. I'm glad you venture out and show us this lovely technique! Beautiful. So rich and warm feeling. This card has so much interest that I hardly know where to start looking -- the glimmer is truly beautiful! I love the background and the way you used all of the color as well and the focal image just pops! Love the technique! 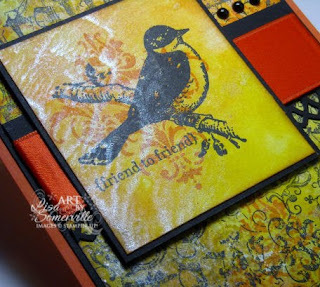 This is very pretty, love the distressed look! What a beautiful card- the colors work so beautifully together. The technique is wonderful too- I love the shimmer. I love the stamp you used too! And....is that a cupcake??? Your card is so warm and stunning! Wonderful color combo for such a winter day as this! This is beautiful, Lisa! Love the rich, warm colors and shimmer. dial up? Bless your heart! Your artwork is gorgeous! Love the colors! 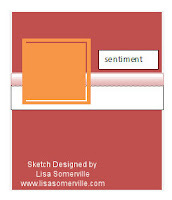 Lisa your colors are divine..love the shabby shutters with this background..the glimmer shows up nicely on my screen..
You are so creative with this set, you made me buy it and now you are making me want to find it, lol! Great card. Gorgeous Lisa! Love the shimmer and the details you added to the card! Super pretty card Lisa! Thanks for the inspiration! Great Sketch! Your card is gorgeous, I love the colors of it. Your cards are always amazing! I am just in love with this one! The colors are perfect! Thanks for the inspiration, once again!